What Is Your Free Trial? For Standard Plan users, you’ll be given access to a 14 day free trial period, where you’ll be able able to sign up for CauseVox for free (no credit card required). 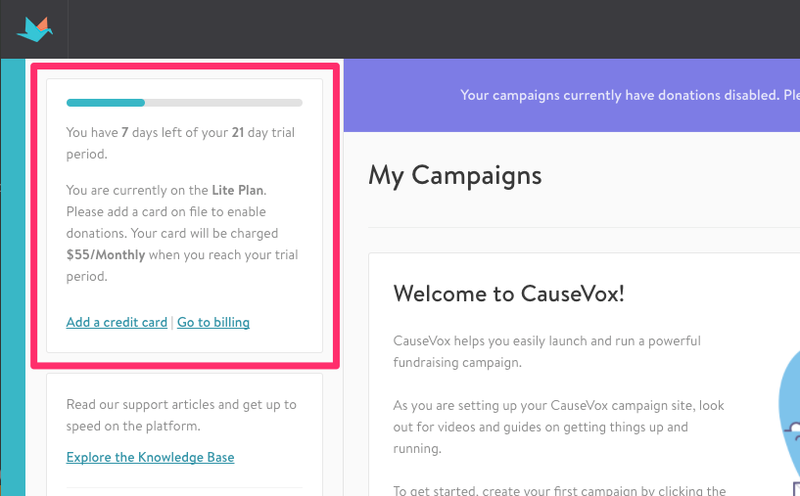 After signup, you’ll have 14 days to explore CauseVox with no restrictions, create any type of fundraising campaign, and raise funds online before the monthly fees kick in. Monthly fees, if applicable, begin when your 14 day free trial comes to an end. If you have a valid card on file, your card will be charged your subscription amount, $185/mo for Standard. If you're ready to complete setup of your campaign and/or launch it, and don’t have a card on file, you can login to add your credit card. You can add a card or upgrade at any time during your trial. If you’re not looking to use CauseVox, you can also let your trial expire without a credit card on file. When your trial expires, the site won't be public, and your account will be suspended. You’ll be able to login and upgrade to paid service to continue to edit the site as you last left it for a short period of time. We also have the Basic Plan which has no monthly fee, regardless of how much you raise. CauseVox and credit card transaction fees are active at all times during the 14 day trial period. For all users, you’re able to login at http://admin.causevox.com/login to view your free trial period status. View your free trial period status in the upper left corner of your Home (Campaign Listing) screen. Ready to upgrade? Here’s how you can navigate to your billing page. If you have any questions about your account or your next steps, send us an email at support@causevox.com and we’d be happy to help!